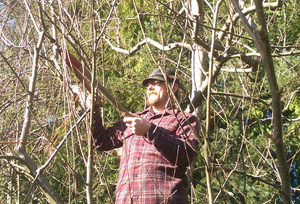 Late winter is the perfect time to prune for structure and fruiting; come learn how! Fruit trees - especially apples and pears, and to a lesser extent, plums - thrive with yearly pruning to encourage fruit production and minimize bough breakage and disease. Late winter is the perfect time to prune for structure and fruiting; we'll discuss and demonstrate examples of how to train and prune young trees, repair years of neglect in mature trees, and how to maintain a balance of fruiting wood and young growth. Bring your own sharp loppers or secateurs if you want to practice! As TLC Farm's orchardist, brush has been tending fruit trees at TLC Farm for twelve years. He is especially infatuated with the heirloom cider apples trees, and can tell you about all 54 varieties of apples that grow on the land.